Today is Nigeria’s Independence Day and also a New Month. Days like this are always anticipated and revered and Google has joined the rest of the world in celebrating Nigeria @56. Since 2010, Google has been creating illustrative artwork that features the colors, cultures, flags or fabrics of Nigeria. And this year is no exception. We have Doodler Robinson Wood to thank for such a lovely artistic impression. Exactly 55 years ago, Nigeria got her independence from colonial rule. Since then, the party hasn’t stopped. We may not have our Utopia yet but we’re getting there. The event is been marked by the display of a Doodle shown to web browsers around the world. This is similar to what the internet giant did when it celebrated its own birthday a few days back. 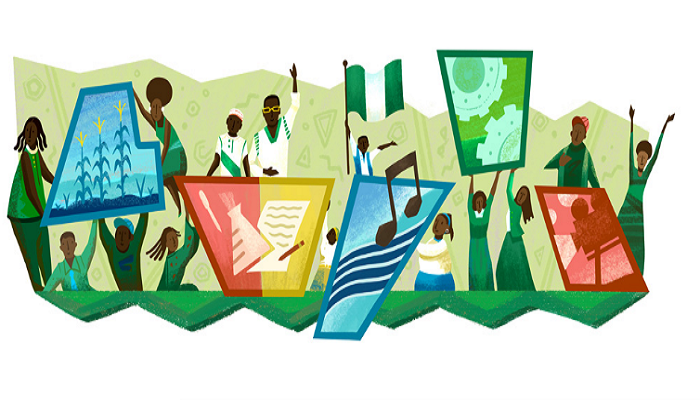 This is the fourth doodle for Nigeria’s Independence Anniversary to be created by Google since October 2010. Today’s Doodle showcases sectors that Nigeria is developing and takes great pride in, such as agriculture, science, literature, engineering, and culture including Naija music and the Nollywood industry. Young people are key to the country’s future and are shown here celebrating in patriotic green and white fashions. Last year, the Doodle is a creative rendition of the Nigerian coat of arms. It featured the mighty Niger and Benue rivers that wind across the country’s fertile plains before merging and flowing into the Atlantic. Symbolic of resoluteness and strength, an eagle cuts across a vast Nigerian sky at the center of the logo, which Doodler Robinson Wood has washed in the colors of the Nigerian flag. To mark the Nigeria’s 54th Independence Anniversary Day celebration in 2014, Google had a GIF doodle that features the three most popular means of transport for daily commuters in Lagos, the country’s commercial capital — the motorcycle, popularly referred to as Okada, the mini-bus, popularly known as danfo, and the tricycle, widely known as Keke Marwa. The passengers in these vehicles also appear to represent the three major tribes — Hausa, Igbo, and Yoruba — respectively, dressed in their native attires and carrying the Nigerian flag, grinning and waving as they ride on. In 2013, Google’ Doodle for Nigeria’s Independence Day featured the colors of the Nigerian flag – green and white – with a touch of different shades of green and grey patterned like a Nigerian (native) fabric popularly sewn and worn by the Hausas. Google went silent in 2012 as there was no doodle to mark Nigeria’s Independence day. 2010 was the maiden edition and came with Google’s default doodle heralding the Nigerian flags. According to Google history, the concept of the doodle was born when Google founders Larry and Sergey played with the corporate logo to indicate their attendance at the Burning Man festival in the Nevada desert. This was in 1998, before the company was even incorporated. They placed a stick figure drawing behind the 2nd “o” in the word, Google, and the revised logo was intended as a comical message to Google users that the founders were “out of office.” While the first doodle was relatively simple, the idea of decorating the company logo to celebrate notable events was born. Two years later in 2000, Larry and Sergey asked current webmaster Dennis Hwang, an intern at the time, to produce a doodle for Bastille Day. It was so well received by our users that Dennis was appointed Google’s chief doodler and doodles started showing up more and more regularly on the Google homepage. In the beginning, the doodles mostly celebrated familiar holidays; nowadays, they highlight a wide array of events and anniversaries from the Birthday of John James Audubon to the Ice Cream Sundae.